A warm and intimate ambience, a relaxing environment, soulful music, sybaritic indulgences, these are some elements that make a spa treatment much more than facials and massages. 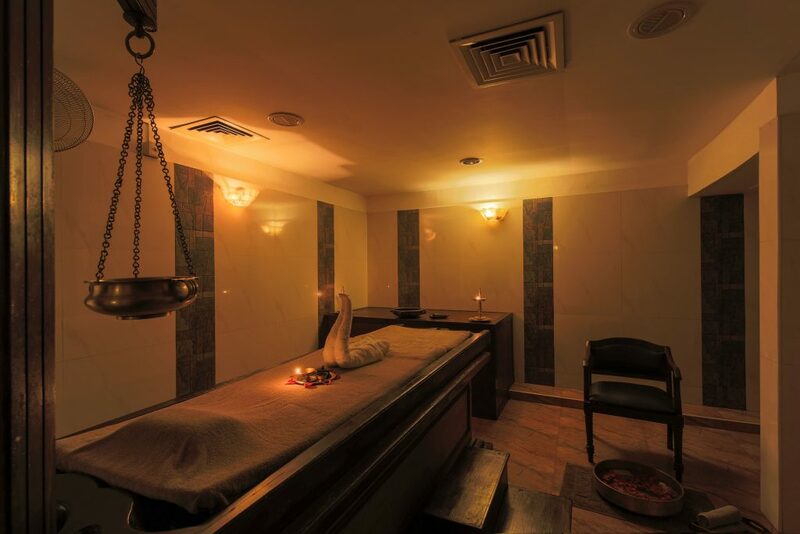 Le Meridien brings to you the legacy of Ayurveda along with its relaxing, rejuvenating and beautifying holistic rituals, to pamper, purify, hydrate, and soothe your body, mind, and soul through Ayuh Ayurveda Spa. 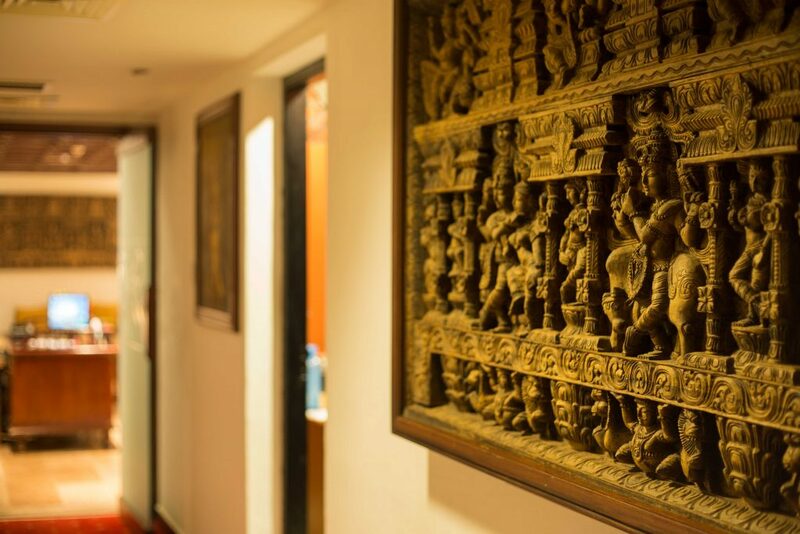 The spa takes pride in reflecting the authentic, traditional, and unique Keralean (belonging to Kerala, India) culture and customs, wrapped with luxury and decadence. 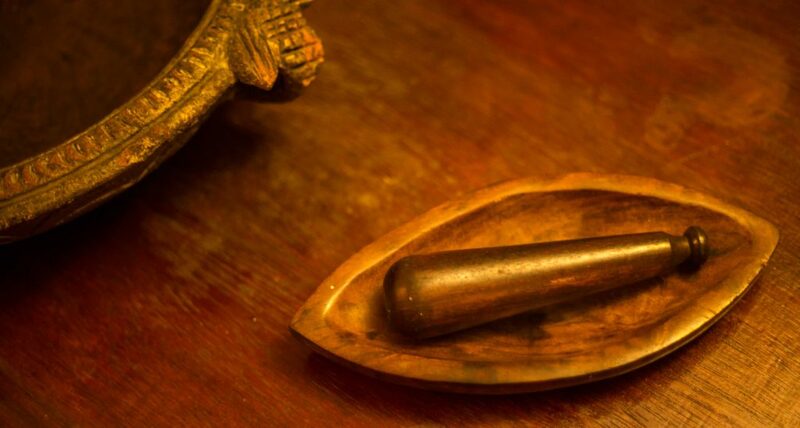 Ayuh Spa stays true to the heritage of the centuries-old, science of life, Ayurveda by incorporating its holistic philosophies, rituals, and exotics herbs and ingredients. 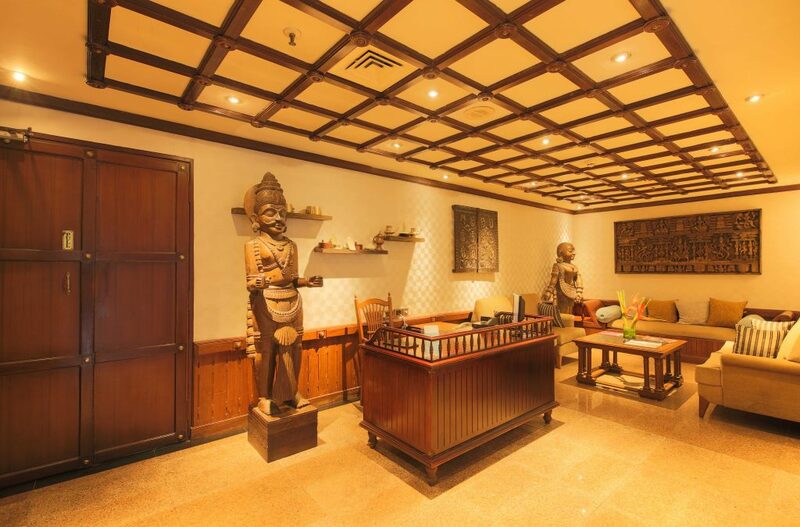 Furthermore, the traditional architectural designs, decors and hues further enhance your spa experience. As I arrive at the warm-lit reception I was greeted by the friendly staffs, every face happy and always ready to help with a smile, a perfect welcome. They introduced me to Ayurvedic Doctor Amrutha Raj. She was pleasant, friendly and explained the benefits of this healing practice. 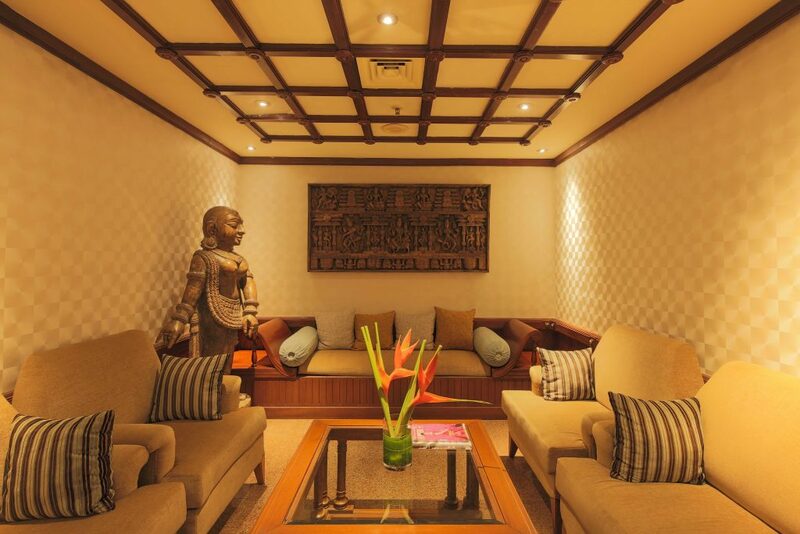 She suggested the signature treatment, Aanandini Beauty Therapy, not just as an aesthetic therapy but a complete treatment that aims to restore your mental balance. An impressive way for the stressed-out folks who spend hours in front of the laptop with countless cups of coffee to unwind and relax. As I fill the questionnaire stating my present health status, one of the attendants brings in their welcome drink, a chilled mixture of juices and Ayurvedic herbs. Little did I know that the treatment that awaited was a restoring and rejuvenating journey, something I have never experienced before. They usher me to the spa, a warm and elegant setting inspired by the local architecture, wooden elements and earthy hues for an exotic luxury, and soulful music that drifts you to a far-off mountainous retreat. The masseuse Vinodini introduces herself, and a brief chat with her eased my initial shyness. The sensual treatment begins as the masseuse places your feet in a brass footbath, cleanses your feet by ritualistically pouring scented, lukewarm water with rose petals. The warmth of the water, the aroma, and the delicate petals, I wonder if it was a dream or reality. 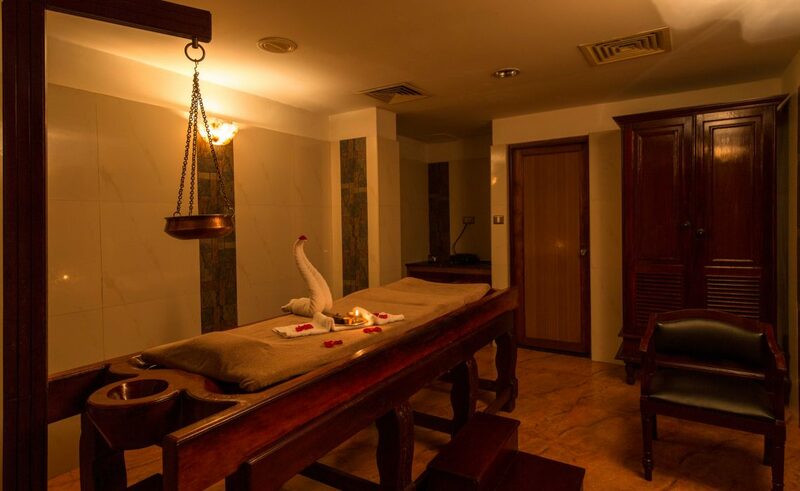 This is followed by the revitalizing oil massage, a sensorial body ritual, starting with the head, neck and shoulder massage and then the full body massage. Vinodini delicately works her way with her skilled fingers, with long sweeping strokes alternating with kneading and rolling. The massage loosens the tight muscles and I could feel the knots of stress slowly untangling themselves. Let me be honest here, I am quite ticklish, so I ask Vinodini to focus on my limbs and body, and keep away from my tummy. The blend of aromatic oils makes your muscles relaxed as well as energized while your skin becomes soft enough to soak up all the goodness of the massage oils. Each ingredient in the therapeutic oil has its own repertoire of benefits. For instance, the Karpur (camphor) is known to have antioxidant properties and lightens skin blemishes. As I inhaled the camphor, my body relaxed, my thoughts blurred and I felt my physical body connecting to the mental and spiritual entities in perfect harmony. Vinodini then escorts me to the sauna. Gentle streams of warm steam moisten your skin, clear out your pores and let the oils work their way into the pores and do the magic. She then carefully applies a hair pack made of indigenous ingredients like herbal powders, medicated oils, and protein conditioners balance and restore the hair’s vitality and shine with a relaxing neck and shoulder massage while the hair mask seeps in for deep conditioning and restoring. We then moved back to the spa for a luscious fruit massage. The fruit puree extracts provide vitamins, minerals and antioxidants which brighten and conditions the skin. A touch of honey will visibly renew and improves skin texture, leaving the skin supple and revived. Lying on my front, my body was treated like a temple with two rounds of the sensuous cocoa, oats, and green gram scrub. Vinodini worked her way along my spine, arms, hands and feet. The mixture was warm, not too dry, do not clump and she applied gentle pressure to stimulate circulation. The treatment not only exfoliates the skin but also enhances lymphatic drainage and detoxification, providing a full boost to those dull and worn out tissues. And now it was time to pamper my face with their beautifying herbal facial and the luxurious Kumkumadi Tailam massage. Kumkumadi Tailum is an elixir, consisting of a unique blend of oils and herbs, including saffron oil. It is formulated to help skin look young, radiant and healthy. After being wrapped I relaxed for some time while Vinodini prepared a medicated bath with milk and herbal extracts. I was shown into the shower, a space that reflects the ambience of the spa. As the lukewarm mixture softened and washed away the scrub I could feel my skin with a new and refined smoothness. After the shower, Vinodini treated my head with a Rasnaadi rub. The final touch of the sandalwood paste on my forehead helped me attaining Nirvana. I returned home radiant and slept like a baby that night. HI, its a wonderful article to read your personal experience, after going through the article ‘Ayuh Spa’ should be in its class. Will definitely experience the spa the next time when I travel to Kerala. Wow, the spa looks amazing! Thanks for sharing! Please do visit when you come down.